Terrorist or criminal attack, fire emergency, civil or geographic disruption, or major electrical failure—recent years have witnessed an increase in the number of natural disasters and man-made events that have threatened the livelihoods of businesses and organizations worldwide. 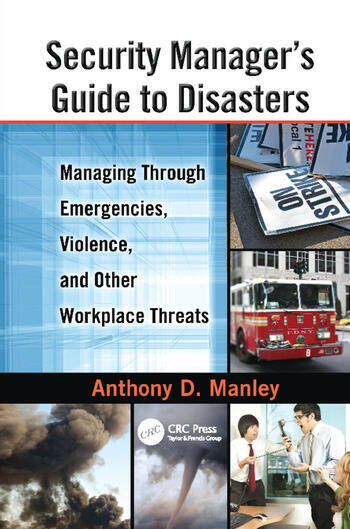 Security Manager’s Guide to Disasters: Managing Through Emergencies, Violence, and Other Workplace Threats examines the most significant emergencies that may confront the security manager and provides comprehensive guidance on how to prepare for a potential crisis, what to do in the event of one, and how to mitigate the effects. The author discusses all types of disasters, covering a range of major occurrences that could threaten or harm any business or institutional entity. These include terrorism, industrial espionage and sabotage, workplace violence, strikes, natural disasters, fires, medical emergencies—the topics run the gamut of events that security directors, loss prevention professionals, and risk managers may confront in the course of their duties. The book provides strategies for preventing or reducing the severity of an incident and initiating immediate and professional responses to reduce the loss of life, injuries, property damage, and liability. It also provides instruction on adequate interaction and cooperation with public safety agencies, local government, and other public and private utility services. By focusing on response, recovery, and restoration, this essential reference lays out a system for placing the business or institution back into operation as soon as possible. The "Color of State Law"
Anthony D. Manley retired from the Nassau County Police Department after twenty-six years as a patrol officer, plainclothes officer, detective investigator, and supervisor. During the last twelve years of police service, Mr. Manley served as a New York State certified police instructor at the police academy, specializing in areas such as management, supervision, and operational standards. Concurrently, during that period, he was assigned to the Departmental Inspection Unit; a specialized squad of administrative officers that conducted detailed examination and analysis, along with internal management and operational audits of all commands within the department, reporting directly to the Commissioner of Police. Since leaving the department, he has several years’ experience as a security consultant, including eleven years in contractual and proprietary management and administrative positions in the private retail sector. Moreover, during the period 1992 to 2005, Mr. Manley was a certified New York State Security Guard Instructor, curriculum developer and senior instructor for a large private school specializing in security officer training, disaster management, loss prevention, supervisory and management development and assorted professional and management training programs and seminars. Mr. Manley has earned an Associate Degree (AAS) in Criminal Justice, a Baccalaureate Degree (BA) in Criminal Justice Management, and a Master of Public Administration degree (MPA). Among his affiliation with various active and retired police associations, he also is a Past President of the Retired Police Association of the State of New York, Inc.
… covers a great breadth of subject matter ... . Starting with a topic familiar to many readers-loss prevention-he moves on to address planning, terrorism, weapons of mass destruction, threats to IT, natural disasters, fires, workplace violence, and the law. … The visual presentation is professional, with quality materials, such as explanatory tables and illustrations. Almost 100 pages of the book are dedicated to the four appendices containing examples of policies and procedures, training topics, homeland security considerations, and a listing of Web sites. Also included are endnotes, a glossary, bibliography, and index. … The book provides a broad overview that could be useful to entry-level professionals … . … the author clearly has a meticulous eye for detail … the arrangement of his material is extremely logical. This is especially true of the series of appendices, which give step-by-step advice on subjests as diverse as systems for searching buildings for bombs and dealing with violence in the workplace. …provides strategies for preventing or reducing the severity of an incident and initiating immediate and professional responses to reduce the loss of life, injuries, property damage, and liability. It also provides instruction on adequate interaction and cooperation with public safety agencies, local government, and other public and private utility services. The author lays out a system for placing the business or institution back into operation as soon as possible.